The new year has arrived with a mix of optimism and uncertainty. Optimism; because latest data prints show better global growth in the second half of 2016; and with expected fiscal stimulus in the US, China and possibly even Europe, growth prospects look better than they have since 2011. The view, both ahead and in the rear-view mirror, is prettier than it has been for a long time. Uncertainty; because outcomes are policy dependent and, for now at least, there is not much clarity about the direction of US fiscal and trade policy. The US will have a new administration soon and the pundit class is still debating just how much of President-Elect Trump’s campaign rhetoric will actually come to pass. For Asia though, two things matter most. First, while global growth is important, what really matters is global trade. ASEAN growth, especially for countries such as Singapore, Malaysia and Thailand, is heavily dependent on external demand. And there are spillovers from trade to domestic demand via employment and income growth. The second is the outlook on global, in particular US, interest rates. Yields on long-term bonds will affect capital flows and hence currency values. Let’s begin with growth. Any upside on global growth comes mainly from the US and that, along with what happens in China, are likely to be the main drivers of Asian trade. The rest of the larger economies (economic areas) are unlikely to have as much influence. Consider Europe. The ECB recently expressed greater confidence in the Euro-area economies as growth came in at 0.3% q/q in 3Q16, the same pace as in 2Q16. Surveys indicate that the pace of expansion is likely to be maintained in 4Q16 giving an annual growth rate of about 1.7%. Moreover, the Brexit vote has not had a material impact. This stabilization of growth has allowed the ECB to signal that it intends to taper its pace of asset purchases from €80 billion a month to €60 billion after March 2017. This path to normalization of monetary policy is likely to be a drawn out affair and that is reflected in the ECB’s growth expectations: 1.7% in 2016 and 2017, followed by 1.6% in 2018. In short, there is stabilization, but not much of a pick-up in growth is expected. By contrast, inflation is expected to rise meaningfully. According to the ECB, headline inflation is likely to pick to rates above 1%, mainly owing to base effects in the annual rate of change of energy prices. Inflation rates are expected to increase further in 2018 and 2019. They foresee HICP1 inflation for the Euro area at 0.2% in 2016, 1.3% in 2017, 1.5% in 2018 and 1.7% in 2019. 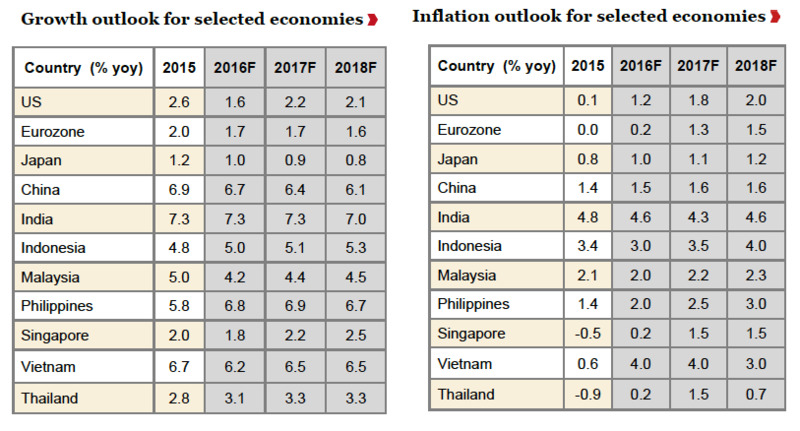 In short, the Eurozone could give Asia the worst of both worlds – a steady growth rate and therefore not much of an additional boost to Asia’s exports, but a meaningful rise in inflation and therefore tighter monetary policy and possibly higher yields. And all this when Article 50 of the Lisbon Treaty, and hence the beginning of negotiations for Brexit, is yet to be triggered. Japan doesn’t provide much help either. Nearly all serious forecasts (for example, those made by the BOJ, OECD or IMF) has the economy growing modestly faster in 2017 and then slowing again in 2018, largely due to fiscal headwinds. The lower end forecasts have the economy growing at close to 0.5-0.6% while the higher end forecasts have it at pace just over 1%. For the rest of Asia, it doesn’t matter very much whether growth in Japan comes out on the pessimistic or optimistic end of expectations. While a good outcome is, of course, preferred, it is unlikely to be strong enough to drive Asian external demand. Similarly, a bearish outcome is unlikely to provide any more headwind than it currently is. The BOJ upgraded the economic outlook at its December meeting, perhaps signalling stabilization. 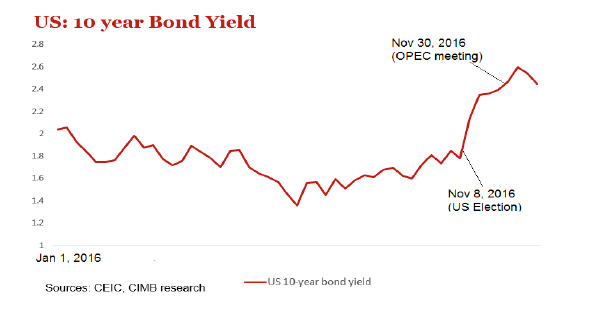 Monetary policy is likely to remain unchanged or, if anything, it gets looser if longer-term bond yields rise in response to yields abroad. The China story – a structural slowdown being cushioned by cyclical policies — hasn’t really changed much, though different areas of it get different degrees of importance each year. What may be changing though is that the need for reforms is getting more urgent and the markets are starting to look beyond the growth story. Chinese growth has held steady in 2016 at 6.7% clip in each of the first 3 quarters and indications are that will be the annual pace too. Yet, there have been significant outflows over the second half of 2016; $530 billion in the first 10 months of year and a fall in reserves of $110 billion over November and December.2 Plus, these outflows are taking place despite tightening capital controls. The structural slowdown in China is due to a variety of reasons: demographics, declining labour productivity, a debt and capacity overhang, and perhaps quite simply a reversion to mean in terms of its growth rate. While worsening demographics and productivity declines imply a lower longer-term growth rate, they do not pose an imminent problem. However high debt does and, in China’s case, we may have reached a stage where the issue of corporate debt needs to addressed immediately or there is a risk of a systemic problem. Stabilization was also emphasized at the Central Economic Work Conference (CEWC) meeting in December 2016, where Chinese leaders and senior officials gathered to map out priorities for 2017. The main message was that policy would be “seeking progress while maintaining stability”. A recent paper by staff members of the IMF also highlight this issue.3 China’s corporate debt problem is both a macro and micro level issue. At the macro level, the return to investment is falling; at the micro level, the financial performance of corporates is steadily declining and risk a spillover on to the asset quality of banks. The need for dealing with this debt build-up is fast becoming an urgent issue. While a number of solutions are possible, at the very least credit growth needs to slow down, and that brings with it a slowdown in growth. While the official growth target over the five-year plan from 2016-2020 is 6.5%, there is a very real possibility of an undershoot. For the rest of Asia, the story doesn’t end with a mere slowdown in China and hence lower imports. There is also a rebalancing toward consumption from investment, and consumption is less import intensive than investment. Moreover, even within consumption, additional demand is getting increasingly directed towards services, and that tends to be more domestically oriented. However, the biggest change has come in how China is producing and trading. It had established itself as the terminal point in a supply chain where intermediate goods were imported and things were assembled and packaged and shipped abroad. Domestic value added was low and the imported content was high. That is starting to change. Firstly, China’s production is moving up the value chain and secondly, domestic inputs are starting to substitute for imported ones. Imported parts and components have become a much smaller share of Chinese merchandise exports, going from over 50% at the start of 2000 (and 60% at its peak) to close to 35% today. Domestic value-added for Chinese exports is increasing, thereby reducing trade flows. 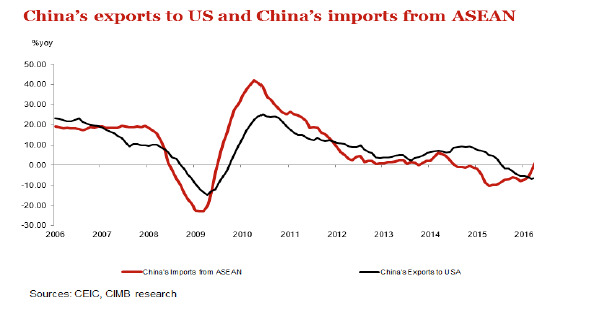 As the chart above shows, previously there was a very strong correlation between Chinese exports and China’s imports from ASEAN. That correlation has broken down over the last few years as China’s domestic value added has increased. There is an additional effect that China has on Asia’s exports via its effect on commodity prices. The World Bank expects some key prices – such and oil and coal – to be higher in 2017.6 However, most of the uptick is likely due to supply reductions rather than a jump in demand. 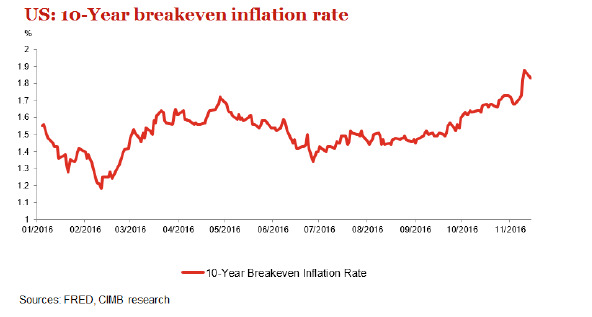 Moreover, recently, demand from China has increased but it seems to be more speculation to hedge against a weaker RMB, rather than real demand dictated by domestic fixed asset investment. China’s influence on the rest of Asia is unlikely to be particularly positive in 2017. As argued above, its impact on regional trade is likely to decline even more. Besides, the currency poses risk (more later). It’s status is changing rapidly from a steady currency to one that is a lot more volatile. And it is under pressure, posing a risk to the rest of Asia. As such, the case for rising Asian exports, beyond the bounce that will come from base effects, rests on what happens in the United States. And there, outcomes are extremely uncertain. There are several reasons to be optimistic about the US economy. 3Q16 GDP growth was 3.5% after averaging just over 1% for the previous 3 quarters. Moreover, a five-quarter inventory overhang appears to be over. Besides that, profits seem to have turned, PMIs are stronger, indeed, the December reading at 54.1 was the best in 2 years, there is wage growth, and the unemployment rate is down to 4.7%, and inflation appears to be rising. The Atlanta Fed Nowcast has 4Q16 growth at about 2.9%. For Asia, though, the devil lies in the details. 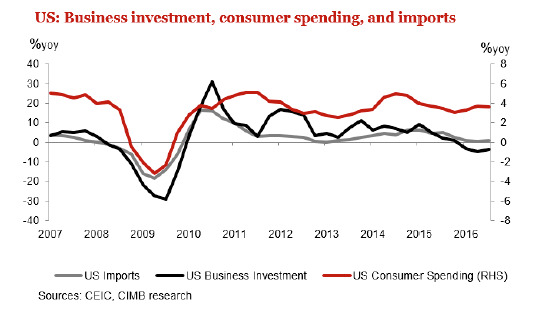 While the US consumer does have a positive effect on Asian exports to the US, the correlation of US business investment, in particular equipment spending is significantly greater. Unfortunately, equipment spending was down 4.5% (saar) in 3Q16, the fourth straight quarter of decline. The key for Asian exports will depend on how rapidly and strongly this can turn around, or how much demand there is. While new orders have had one good month, the outlook is cautionary at best. The US consumer is doing well. Consumption expenditure grew at 3% in 3Q16 and contributed about 2 percentage points of the 3.5% GDP growth rate. Moreover, wages and disposable income are rising implying that the outlook is constructive too. The question is whether there is enough demand to warrant a meaningful increase in manufacturing capacity. Several issues should curtail optimistic forecasts on capex. The first is that while consumption demand is indeed strong, the larger contribution to it is coming from a demand for services, rather than goods. Second, a stronger dollar means that foreign goods are likely to satisfy some of that domestic demand. And third, even with increased demand for goods, capex may still take some time to respond as capacity utilization rates are currently around 75% versus a long term average of 80%. US trend growth is close to 2% (with 0.5% growth of the working age population and the remainder 1.3-1.7 percentage points coming from productivity growth) and 2017 growth will come in around that pace. Anything much faster is likely to be pre-empted by the Fed. This outlook comes with 2 or 3 rate rises by the Fed, mainly pre-emptive as inflation tends to have a fair amount of inertia. The above is the most likely scenario, but then there is uncertainty about the policy direction of the Trump administration. It is still largely guesswork, but a reasonable set of assumptions would have a decrease in regulation, reductions in corporate and personal tax rates, increased expenditure on defense and infrastructure, and at the least some action on trade deals, though perhaps not protectionism, at least not initially. Start with tax cuts. On the personal side, there is likely to be a personal income gain and hence a rise in consumption as long as tax cuts are directed toward people with a higher marginal propensity to consume. That largely means middle and lower income people. Tax cuts directed at people who are likely to save the additional income will have damped second and third round effects. On the corporate side, we need to see both the ability and willingness to invest. Tax cuts are likely to boost earnings and hence the ability to invest. However, it is not going to do much to the willingness to invest for that will depend on the state of demand. Indeed, one could argue that the corporates have not lacked the ability to invest until the end of 2014 when profits were robust. But demand has not been there and that is where fiscal policy should be directed. Much will depend on where expenditure is directed and how it is funded. If expenditure takes place in areas such as roads, bridges, or air transport, it not only would directly boost Asian exports but also would help crowd in private investment providing a further impetus to Asian trade. As most of Asian trade is in intermediate goods catering to investment abroad, the benefits are obvious. Besides that, it would provide a boost to supply chains and that should get trade multipliers going. It will also matter on how this expenditure is likely to be financed. If tax reform – a drop in the corporate tax rate – will get enough funds to be repatriated to finance the stimulus, then well and fine. If, however, the hope is that policy measures will suddenly get the US economy growing at 4% or more, and that the higher growth will generate enough revenues, then there is likely to be not only disappointment, but also higher deficits. Moreover, a 4% plus growth rate achieved through pure demand-side measures, without a commensurate improvement on the supply side, would mean overheating and would likely be met by higher rates. Ultimately, it would be unsustainable. There is already incipient inflationary pressure; wages grew 2.9% in December, the fastest pace since 2009. The Fed will surely act. We are already seeing the market impact of an expected fiscal stimulus, higher expected growth and inflation, and possibly higher fiscal deficits: Yields on 10-year US treasuries have risen (yields on had been rising since July, but took off after the election results), the USD is stronger and the breakeven inflation rate (the difference between the yield of a nominal bond and the yield of inflation-indexed bond – TIPS — of similar maturity), which started rising in July, has risen further. Any change in US Fed Funds glide path is likely to be minor for now, that is unless policy changes turn out to be much greater than expected. For starters, my current view has the Fed will raise rates probably another 2 or 3 times this year. The pressure on monetary policy from changes in fiscal policy is more likely a late 2017 or 2018 story. For ASEAN, it means we are possibly nearing the end of a rate cutting cycle. Monetary policy is not just about responding to the Fed, but also about domestic economies, and how respective currencies are behaving and the signal that sends about overall stability. Bank Indonesia cut rates 6 times in 2016 but the cutting cycle may now be over. Similarly for Bank Negara. Much as they would like to cut rates and support growth, the ringgit has been a bit too volatile. Currency volatility is damped in Thailand because of the buffer of a large current account surplus. Moreover, policy rates have been steady despite low inflation, as the transmission mechanism is impaired and credit growth remains poor. I had believed that rates could have been modestly reduced this year once fiscal policy gained traction and monetary policy became more effective. That cut may be off the table. The Singaporean economy is highly reliant on trade and financial flows. Higher yields will not help it. Monetary policy settings are currently at “neutral” and I do not expect a change. The SGD will probably bear the brunt of the adjustment and weaken along with other regional currencies. There is also a real risk of protectionist policies – I address that later in this essay. effectively means that external headwinds to growth will probably be at their least threatening in years. ASEAN, to its credit, has weathered these last stormy years quite well. GDP, especially in Malaysia and Thailand, but low interest rates have helped keep debt service at manageable levels, limiting the impact on banks’ asset quality. Depending on how fast or how much the Fed tightens, there is a risk of capital outflows.8 The countries that are typically at risk are those who are most in need of external financing or, in other words, countries with large current account deficits. Further, countries where low interest rates had resulted in rapid credit growth or where property prices had been run up are all vulnerable. Let’s take each of the issues in turn. As far as external financing goes, only two countries in MIST plus V have current account deficits: Indonesia and possibly Vietnam in 20179. For the rest, even though Malaysia’s current account has seen some moderation, there is a surplus. Furthermore, there are low debt service requirements and healthy reserves. Even in the case of Indonesia, the current accounts are well financed and there is reserve accumulation. For different reasons, the MYR has come under some pressure and it is likely to stay volatile; which is discussed in the next section on currencies and rates. Nor is Asia particularly leveraged, though there are exceptions. Household debt in Malaysia and Thailand is high, but overall credit expansion has been slowing. intervention and reserve accumulation, so that currencies are unlikely to face great depreciation pressure in the event of capital outflows. Indeed, none of the currencies could currently be considered overvalued. Malaysia. 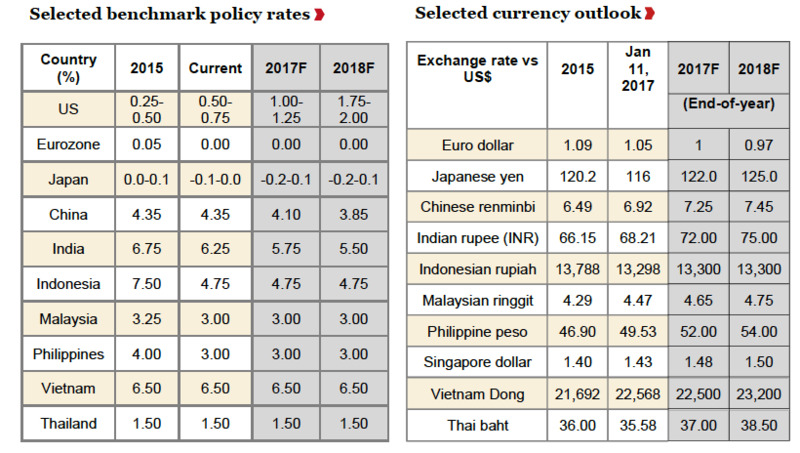 But rates are unlikely to rise and the adjustment to higher rates abroad will come via softer Asian currencies. The IDR may be a bit of a maverick in 2H17, and I’ll address that later. With monetary policy facing constraints, the onus on growth will largely fall on fiscal policy. Previously, there had been a modest boost to consumption demand as real income had increased in line with a decline in inflation. But with commodity prices starting to firm up, the boost to real income is all but over. Most ASEAN countries have self-imposed restrictions on the use of fiscal policy. Indonesia has a 3% of GDP ceiling on its deficit, while Malaysia, Thailand and Vietnam have caps on government debt to GDP. 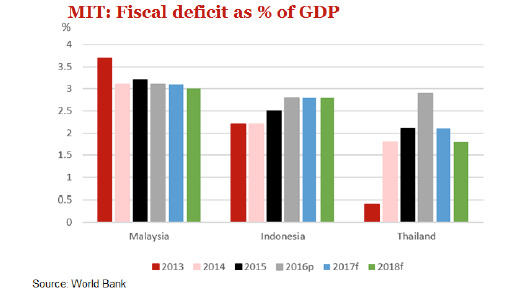 Except Thailand, where there is significant leeway — government debt-to-GDP of 43% versus a 60% ceiling — the fiscal space in the remaining countries is close to its limit; Indonesia’s deficit is expected at 2.7%; Malaysia government debt to GDP is close to 54% while the ceiling is 55%; Vietnam is close to its 65% ceiling. With little space, the chances of a pure fiscal stimulus in any of the countries are low. Indeed, most governments do not intend posting higher deficits in 2017, though Thailand has provided a substantial boost in 2016. In the event that a pure stimulus is kept under check in 2017, the nature of expenditure becomes important so that fiscal multipliers are improved and long term productivity is enhanced. To some extent, most of the governments are doing that: targeting infrastructure and helping to boost SMEs. However, they are also restricted by their need to cushion the downturn for the poorer segments of society. It is a balancing act. Lastly, there is the risk of policy failure. To us (and at least in theory, the IMF)10 it is clear the fiscal policy needs to step up, especially in current account surplus countries. Growth is faltering, monetary policy is not working, there is fiscal space, and so that space needs to be used or the problem gets worse. Will we see it? 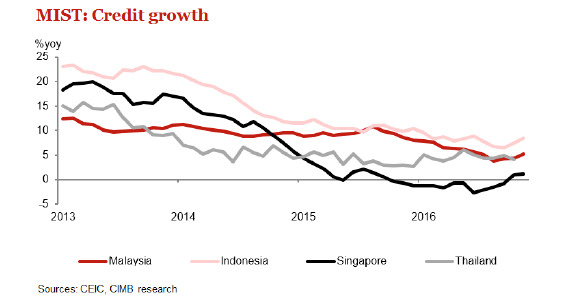 Indonesia has probably been the most pro-active with fiscal policy, recognizing that the end of the commodity boom meant that the economic model had to change. Revenue was boosted through a tax amnesty program, reforms were stepped up, expenditure was directed toward boosting growth potential, and alternate industries are being targeted for the future. Hopefully, public investment will also crowd in private investment. To be sure challenges remain; consumer demand is not as robust as one has hoped and there are likely to be future questions about government revenues. However, there is also no doubt that the economy is on the right track. For Malaysia and Thailand, the challenges are similar but with upcoming elections in both countries, the need to cushion the impact of the slowdown on the common man is even greater than usual. Public investment plans, especially in Thailand, are large and will contribute to future growth. However, the extent to which this expenditure will drive growth i.e., boost other elements of demand, remains to be seen. In Malaysia too there are plans to boost infrastructure and government-linked companies in transport and utilities are expected to make significant capital expenditures over the next two years. However, business sentiment has been declining through 2016 and a response from private investment will probably not be forthcoming. In the near-term, that is over 2017, the biggest benefit to growth in these two economies is likely to come from the stability in the external sector and some degree of firmness in commodity prices. Singapore, because of its nature and size, probably faces the most challenges when the external environment is difficult. Preliminary estimates indicate that GDP grew at 1.8% in 2016 with unexpectedly strong growth of 9.1% qoq in 4Q. The 4Q rate is an anomaly as the economy is still struggling. An improvement in the external environment will provide some relief but even MAS agrees that 2017 may not be much better with growth between 1-2%. Structural adjustments in manufacturing sector, worsening demographics and productivity growth limit the upside on growth. The external environment for Asia is stabilizing but remains risky. Europe and Japan are likely to grow near trend and also unlikely to have significant changes in policy. Their impact on Asia is neutral. China poses a risk, especially on its currency and continues to be a drag on export demand as it slows, rebalances, and on-shores production of materials it used to import. The US provides a wild card. As matters stand, it appears to be returning to trend growth of close to 2%. Consumption is driving growth but the import intensive part of growth for Asia – business, in particular equipment, investment, is a 2H17 story at best. The US economy is close to, or at, full employment. There is inflationary pressure, or at least wage pressure. In any case, the Fed is likely to act. For Asia, this external environment means that export growth should stabilize, some of it through base effects and some through a healthier global economy. 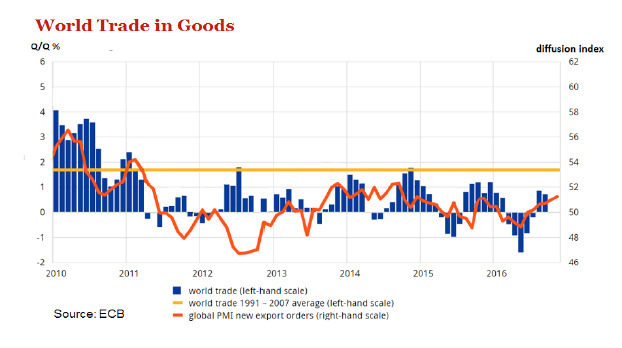 But is hardly likely to be robust – the structural drag from China and the continued modest outlook on business investment globally will take care of that. Moreover, there may still be some time before there is a private-sector led domestic response in Asia. Rising global rates mean that the rate cutting cycle is probably over in Indonesia and Malaysia. In any case, monetary policy was providing more of cushion by keeping debt service payments low rather than providing a boost. The transmission mechanism remains impaired and credit growth is poor. The onus for boosting domestic demand then falls on fiscal policy, not just to cushion growth in the short term but to also secure the future by enhancing productivity. While Thailand and Malaysia have infrastructure plans, I think Indonesia is probably ahead in the game. There has been recognition in Indonesia that the end of the commodity super cycle has meant a rethinking of the economic agenda. The government has responded well and the chances of crowding in private investment are highest there. Rates across Asia are likely to go on hold for a while until the volatility settles. But they are unlikely to rise and that means the adjustment to higher rates abroad, and USD strength, and weakness in the RMB will happen through the currency. As a high yielding currency, the IDR probably does best. Malaysia does not have much space to use other buffers, such as reserves, and the MYR probably tracks the RMB. A large current account surplus protects the THB. Besides the usual apprehensions about domestic politics, geo-politics, excessive market exuberance etc. there are two clear concerns this year, both of which have a reasonable chance of occurring: Trade wars and meaningful RMB weakness or at least more weakness than what you’re seeing in most forecasts. China and the RMB. The Chinese story has been a simple one: A structural slowdown being cushioned by fiscal stimulus and credit expansion. But credit expansion at 20% annually from 2009 was faster than nominal GDP growth and hence the credit to GDP ratio kept growing. Of course, this was unsustainable, and so the easiest call in the world was to predict that it couldn’t go on. One side of the call was to predict financial disaster and some commentators have been doing it for years. The harder call is to time when would China would shift emphasis from growth to dealing with the credit bubble. I think that we are close to that time and the message from the recent CEWC meeting echoes that. Despite growth holding steady, China is steadily losing reserves in large numbers. That means that markets are looking beyond growth and hoping for some sign of financial stabilization. The authorities will do that – they must, for after all, the current path is unsustainable – and price will be slower economic growth. At the very least, credit cannot keep growing at this pace. Most likely there will be deleveraging and insolvencies. However, at the same time, they cannot give up the ghost of growth, especially heading into the 19th Party Congress in the autumn. So fiscal policy, to the extent possible, will be stimulative. And perhaps, more importantly, the currency will be kept weak to help exports. Given the current situation, and the markets’ change in emphasis away from growth to stabilization, the authorities have two choices. And under both scenarios, the RMB will be weak. If they still focus on credit-fuelled growth, and try and meet growth targets, the RMB will weaken as capital outflows are likely to increase. If they change focus to stabilization and deleverage, growth will suffer domestically. They would then like to keep the RMB weak by design to cushion that softening. Mind you, we aren’t part of the “financial disaster” or the “sharp devaluation” crowd, but the risk of a large movement in the RMB is a real one. Given China’s reserves and its low threshold for imposing capital controls, the path to a weaker number will probably be gradual one. Needless to add, Asian currencies will also move in tandem. Trump, Trade, Tariffs. Try saying “Trump, Trade, Tariffs” very fast three times in a row and you’ll notice it is quite a tongue-twister. But one should start practicing, for the possibility is a real one. Consider one of Mr. Trump’s core promises to the US electorate – to restore better paying manufacturing jobs. And to him, trade, or rather unfair trade practices, and immigration were largely responsible for these job losses. As such, Candidate Trump had threatened to walk out of trade deals, such as TPP, and renegotiate some others, such as NAFTA. He threatened to call China a currency manipulator11 and to also impose rather large tariffs – as high as 45% — on Chinese goods. Since the election, a consensus seems to have come about that yes, perhaps, President Trump may walk out of trade deals and label China a currency manipulator11, but he would not impose tariffs. That would be much too disruptive for US companies. I am not so sure. Consider the following chart – the share of manufacturing jobs in total employment – and one can recognize the enormity of the promise that Mr Trump has made. He will be trying to reverse a 70 year-old trend. To some extent, in the latter years, trade with the Chinese is responsible for part of this movement as the US helped China join the WTO in 2001 and also tolerated an artificially weak currency. They probably calculated that a China within the WTO would be easier to deal with than an isolated China. Chinese products flooded the US market, resulting in some job dislocation and downward wage pressure in certain industries. Without regional labour mobility, certain geographical areas were affected more than others. So yes, trade played some role but the larger story is that the decline in the share of manpower in manufacturing is largely due to automation and technological progress. And it is a story that has been in place well before China started to become a manufacturing and exporting juggernaut. In other words, for Mr Trump to deliver higher paying manufacturing jobs, he would have to try and reverse technological progress. The main question is what does the administration do when they realize they can’t deliver the jobs that Mr Trump had promised? And as the chart above shows, the chances of delivering high paying manufacturing jobs are slim. The US can start by labelling China a currency manipulator and debunk TPP and renegotiate NAFTA, and do whatever else they want, but those jobs aren’t coming back. What happens then? Does the US then go after the reasons that Mr Trump gave — immigration and trade – for the job losses? If they can’t cure the problem, do they attack its alleged culprits of the problem, regardless of how little economic sense that may make? The possibility of tariffs is a real one. And we know that if the US imposes tariffs, China will not appear weak, especially not with the 19th Party Congress due to take place in the autumn. They will retaliate. There will be serious volatility in financial markets with real effects. Of course, I hope it doesn’t come to that. Apart from no trade wars, I wish you many other wonderful things for this year! From our team to you and yours: Happy New Year! 1 HICP is Harmonized Index of Consumer Prices. 2 The change in reserves reflects both outflows and revaluation effects, the latter being simply a “marking-to-market” of nondollar- denominated assets. As the dollar strengthens, these assets lose value in dollar terms, and that is reflected in lower reserves in dollar terms. Calculations show the $70 loss in November was equal parts outflows and revaluation, while the $41 change in December was probably about $16 billion in outflows and $25 billion in revaluation. 3 “Resolving China’s Corporate Debt Problem”, by Wojciech Maliszewski, Serkan Arslanalp, John Caparusso, José Garrido, Si Guo, Joong Shik Kang, W. Raphael Lam, T. Daniel Law, Wei Liao, Nadia Rendak, Philippe Wingender, Jiangyan Yu, and Longmei Zhang, IMF Working Paper, October 2016. 4 Credit is defined as nonfinancial private credit, including credit to local government financing vehicles. 5 The IMF offers evidence from Spain after the GFC, Japan in the early 1990 and Thailand post 1997. 6 World Bank Group. 2016. Commodity Markets Outlook, October. World Bank, Washington, DC. License: Creative Commons Attribution CC BY 3.0 IGO. 7 As Nobel Prize winner, Joseph Stiglitz, puts it, “If Trump chooses shovel-ready projects, the long-term impact on productivity will be minimal; if he chooses real infrastructure, the short-term impact on economic growth will be minimal. And back-loaded stimulus has its own problems, unless it is managed extremely carefully.” Project Syndicate, December 19, 2016, “Bad News for America’s Workers”. 8 Much as we, and everybody else, has a forecast on the glide path of the Fed Funds rate, the truth is there is a fair amount of uncertainty around it, even more than usual. The glide path depends, inter alia, on fiscal policy and, with a new administration, as we’ve highlighted before, neither the measures nor expected magnitudes of these measures are clear as yet. 9 In 2016, Vietnam’s current account is expected to being in balance and possible even have a small surplus. In 2017, we expect a modest deficit. 11 Being labeled a currency manipulator actually means very little. All it means is that the US Department of State and the Chinese authorities will enter into a dialogue.